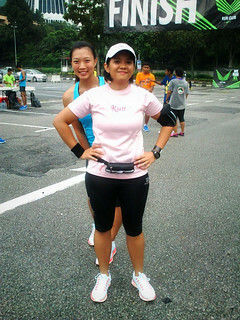 This is the 2nd session in the Nike We Run KL training series. The evening before the Salomon X-Trail Race (29 Sep), I joined the Nike Run Club in yet another training session. 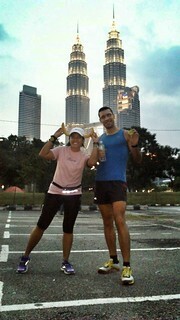 This time the Nike team wanted to tackle interval training at the KLCC Park. It was drizzling when we left PJ so we weren’t sure if the run would still go on in that kind weather. But runners will be runners, stubborn and determined – if not mad – so when we arrived at the Binjai Car Park area, sure enough the whole gang was there, ready to dash. This time around I decided to finally try out the trial shoes of the day, so I took off my almost mint purple Brooks PureFlow and put on a pair of new Nike LunarGlide+ 4 Shield for Women, which are touted as water and rain-proof, which was a pretty neat coincidence considering the weather at the time. The boys had theirs in blue whilst the women’s trial shoes were in an off-white hue. I saw Karen again (of course) at this session, and she photo-bombed me as I was having mine taken. It’s alright, I like my trainers cheeky. Before we ran the pacers and emcee welcomed us all with their usual rah-rah speeches and background stories. This time they asked the crowd if they knew what interval running was, and the young folks being asked knew the concept well. I have also incorporated this training method into my weekly runs too and it’s a great way to slowly build up speed and stamina. We were broken up into our fast, moderate, slow, and newbie groups again, and the strategy was to run around the 1.3km loop of the KLCC park, alternating between fast and slow laps. Personally I felt that doing intervals based on that distance was a bit too much to tackle especially for newbies. I would have preferred if they did it in terms of time (e.g. 1 minute fast, 1 minute slow x 8 times, and then repeat or increase to 2 minutes fast, 2 minutes slow x 4 times). It’s just easier to run in chunks of time, I think. Anyway my preference aside, I did what I could and followed the group, but before I could even start out the 1st lap I had to go use the ladies’ and there wasn’t one in the park, so I had to sprint into the Suria KLCC Mall to find the loo then come back out again. Of course by this time I’ve lost my group so I just joined whichever group looked like they were wearing the Nike trial shoes. Running in KLCC Park is nice, the rubber track is OK to run on, the park has a nice vibe and view and the Twin Towers are just there for you to feast your eyes on. But it gets to be a bit too much with so many people especially tourists stopping by for a photo shot and you’re dodging cameras so that you don’t accidently enter their frame (we joked that we could be the colorful locals in the background). A few of the guys in the park sort of mimicked us running, I don’t know for what reason – probably to tease us. While I was running I kept my eyes peeled for Abdoullah, an Algerian runner friend who works in Jakarta who also happened to be in KL that weekend. Interestingly enough we had been introduced through the IndoRunners group. But because he is not in the habit of running with a phone it was difficult to contact him so I just prayed that fate would bring us together and we’d bump into each other at the park. Didn’t happen. As I’m finishing up the 2nd lap I caught up with Wan, one of the Nike ambassadors who always talks about foot types and pronation. It seems that he couldn’t run due to an injury sustained from some karate gig that he did, so he was confined to only walking. But after a while I think my jogging motion sort of rubbed off on him so we finally both broke into an easy jog around the park to pass the time faster. I finished up 3 loops around the park then decided to go back to the meeting point at the car park because it was getting darker and just about everyone was done. Johnny who was holding up the last motivational signboard before I ended my run held out his hand for a high-five, but the sneaky guy kept running backward with an impish grin, prolonging the journey for me to give him the high-5. I’m telling you, these Nike guys are naughty. We had our usual post-run fuel of water and bananas, then as I was talking to Karen a tall figure loomed over me, practically soaked in sweat. I looked up and the figure boomed, “Farah?” It was Abdoullah! He had found me, perhaps guided by the loud music and Nike banners. We shook hands and he helped himself to the banana stash, there was plenty to spare. I asked him if he wanted to have dinner and he agreed, so we tucked into Teppanyaki at the food court before retiring for the night. I did after all have to run a race the next morning. In terms of the LunarGlide+ 4 Shield trial shoes which I tried on, I was surprised how well I could run in them but then again they were neutral shoes and my foot type adjusted pretty well. They were light and kept my feet dry, not that it was pouring cats and dogs or anything. The toe box width was ample for my wide feet, though I did find the landing a bit hard (maybe they’re still new and needed time to break in). All in all, a likeable pair of shoes, except perhaps for its high price tag. In conclusion, this training session was OK, the location was awesome, although the execution method could have been better in terms of setting more zoomed-in and smaller interval laps. Using time or a shorter interval distance (e.g. 400m) would’ve been a plus for me, personally. I also like to train in KLCC Park, but since they have started the building work in that area, the track has changed and I was wondering what was the new distance. Hello Marie, thanks for writing in. I was not even aware that the distance of the KLCC track has changed! I don’t run that often in KLCC. However after checking with friends who regularly run there, the route now has now been reduced from 1.3km to about 1.1km. I believe the route has been cut near the Exxonmobil building where it no longer lets you pass by the mosque.